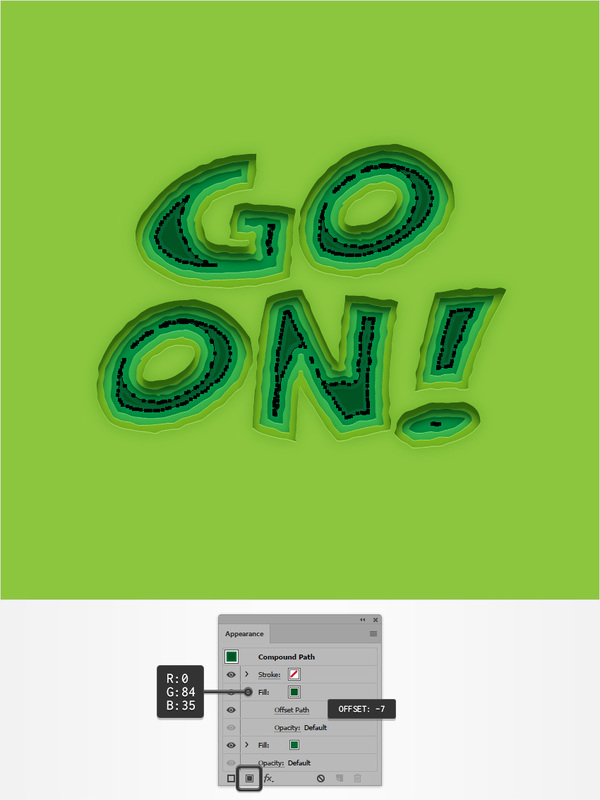 In the following steps you will learn how to create a layered paper art text effect in Adobe Illustrator. For starters, you will learn how to set up a simple grid and how to create a pretty simple background. Using a free font and basic vector shape building techniques, you will learn how to create a set of compound paths. 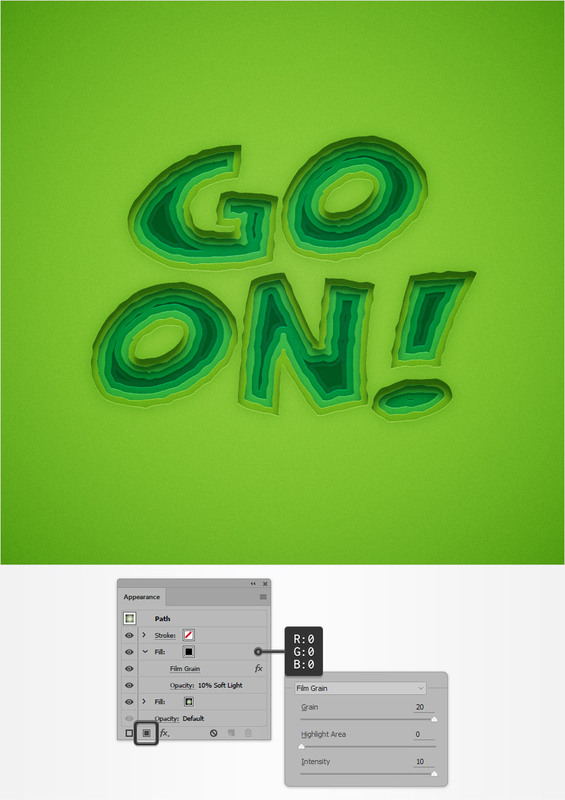 Moving on, you will learn how to create an inner shadow effect using several Drop Shadow effects and some opacity masks. Finally, you’ll stylize your compound paths, and you’ll learn how to add a subtle texture for your final design. Hit Control-N to create a new document. 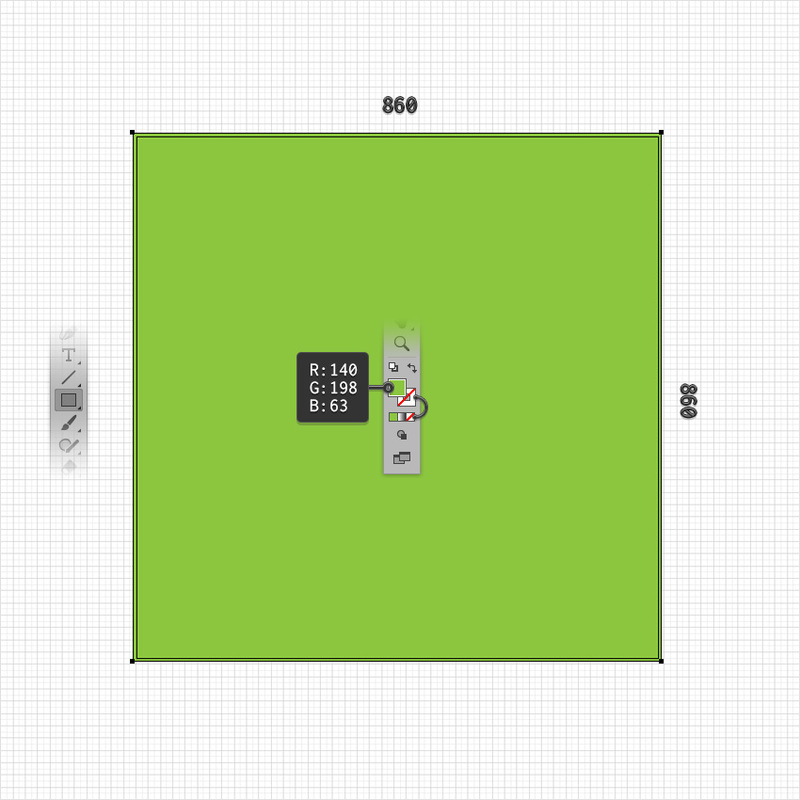 Select Pixels from the Units drop-down menu, enter 850 in the width and height boxes, and then click that More Settings button. Select RGB for the Color Mode, set the Raster Effects to Screen (72 ppi), and then clickCreate Document. Pick the Rectangle Tool (M) and focus on your Toolbar. 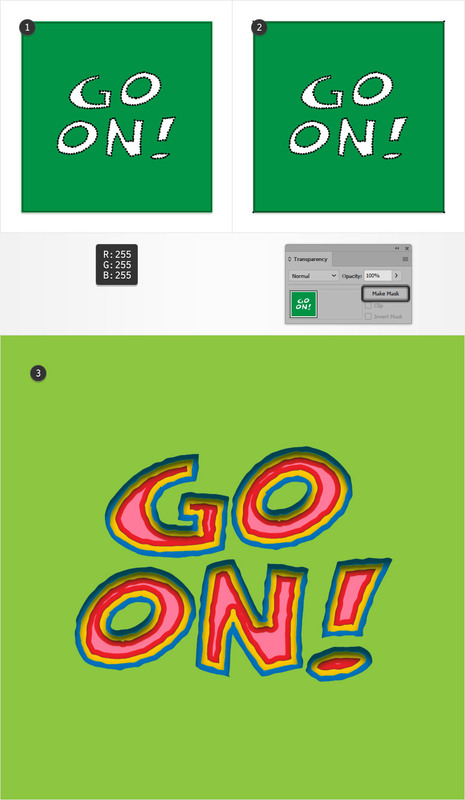 Remove the color from the stroke and then select the fill and set its color to R=140 G=198 B=63. Move to your artboard, create an 860 px square, and make sure that it covers your entire artboard. Pick the Type Tool (T) and open the Character panel (Window > Type > Character). Select the Comical Cartoon font, and set the size to 130 px and the leading to 220 px. 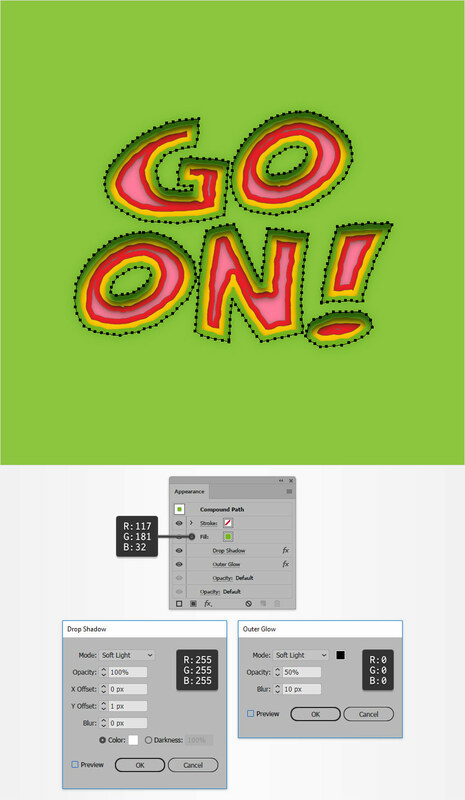 Simply click on your artboard, add your piece of text, and set the color to R=0 G=113 B=188. Make sure that your text is still selected and go to Type > Create Outlines (Shift-Control-O). Ungroup (Shift-Control-G) the resulting group of shapes and then go to Object > Compound Path > Make (Control-8) to turn your blue shapes into a compound path. Be sure that your compound path is selected and go to Object > Path > Offset Path. Enter a -10 px Offset and then click that OK button. Select the resulting compound path and simply replace the existing fill color with R=255 G=200 B=0. Select your yellow compound path and go to Object > Path > Offset Path. Enter a -10 px Offset and then clickOK. Select the resulting compound path and simply replace the existing fill color with R=240 G=30 B=40. Select all three compound paths and go to Effect > Distort & Transform > Roughen. Enter the attributes shown in the following image, click the OK button, and then go to Object > Expand Appearance. Select your red compound path and go to Object > Path > Offset Path. Enter a -10 px Offset and clickOK. Select the newly made compound path and simply replace the existing fill color with R=255 G=123 B=155. Select your blue compound path along with the green rectangle, and add copies in front (Control-C > Control-F). Bring these two copies in front (Shift-Control-]) and then click the Minus Front button from the Pathfinder panel (Window > Pathfinder). Turn your resulting group of shapes into a compound path (Control-8), set the fill color to R=140 G=198 B=63, and then go to Effect > Stylize > Drop Shadow. 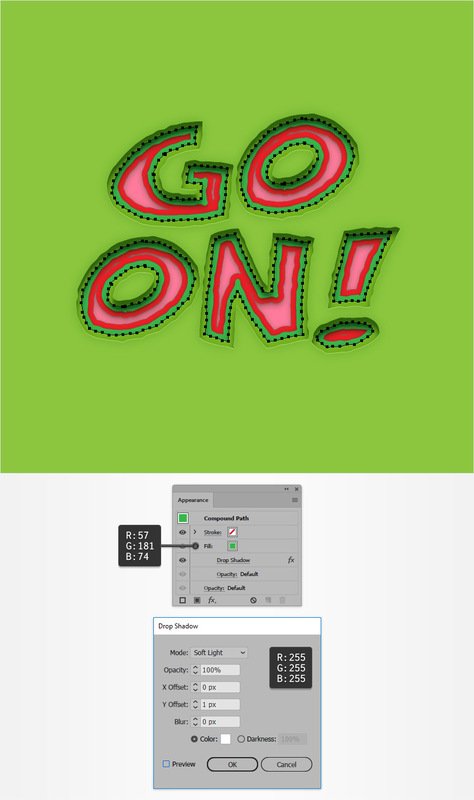 Enter the attributes shown in the left window (in the following image), click the OK button, and then go again to Effect > Stylize > Drop Shadow. Enter the attributes shown in the right window and then click that OK button. Make a new copy of your blue compound path (Control-C > Control-F), bring it to front (Shift-Control-]), and replace the existing fill color with white (R=255 G=255 B=255). 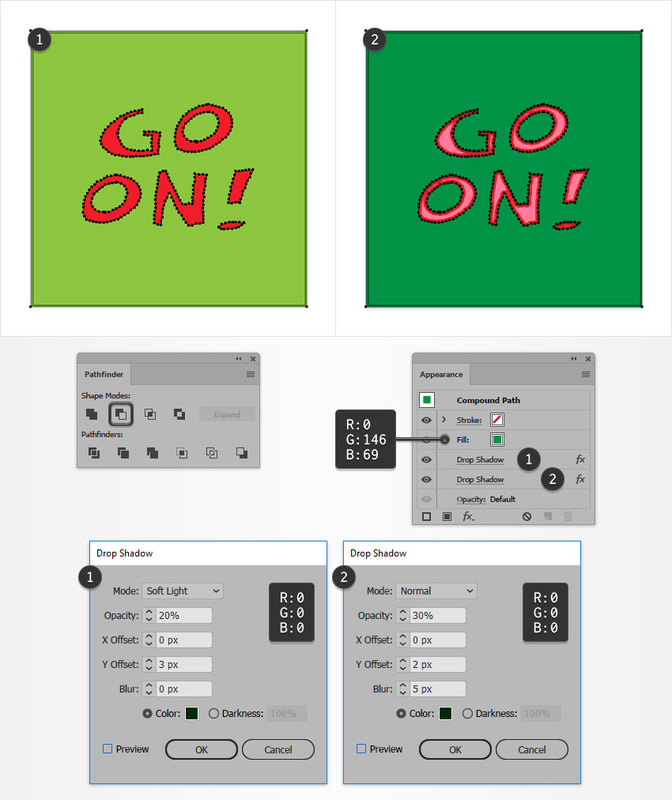 Select your white compound path along with the one made in the previous step (the one with the Drop Shadow effects), open the Transparency panel (Window > Transparency), and click that Make Mask button. Select your yellow compound path along with the green rectangle and add copies in front (Control-C > Control-F). Bring these two copies to front (Shift-Control-]) and then click the Minus Front button from the Pathfinder panel. Turn your resulting group of shapes into a compound path (Control-8), set the fill color to R=57 G=181 B=74, and then go to Effect > Stylize > Drop Shadow. 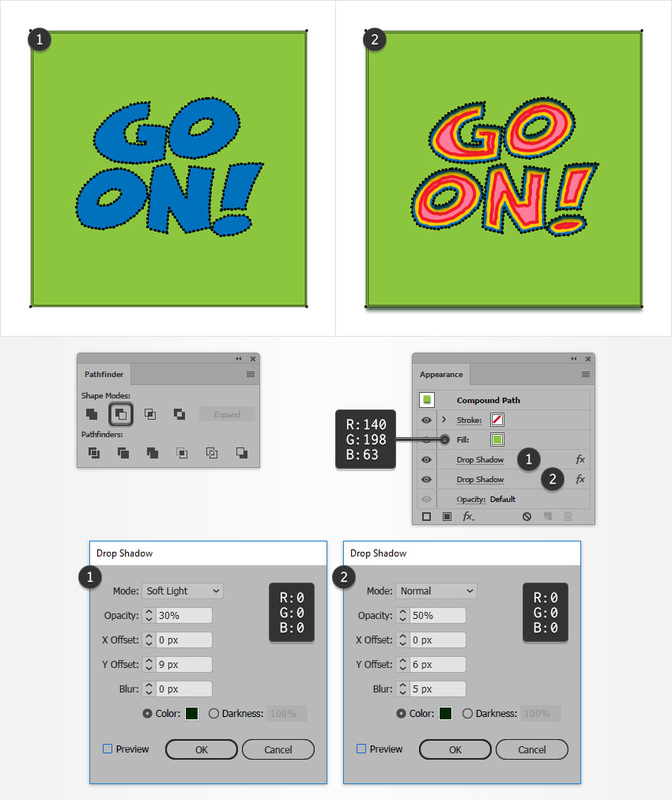 Enter the attributes shown in the left window, click the OK button, and then go again to Effect > Stylize > Drop Shadow. Enter the attributes shown in the right window and then click that OK button. Make a new copy of your yellow compound path (Control-C > Control-F), bring it to front (Shift-Control-]), and replace the existing fill color with white. Select your white compound path along with the one made in the previous step, go to the Transparency panel, and click that Make Mask button. Select your red compound path along with the green rectangle and add copies in front (Control-C > Control-F). Bring these two copies to front (Shift-Control-]) and then click the Minus Front button from the Pathfinder panel. Turn your resulting group of shapes into a compound path (Control-8), set the fill color to R=0 G=146 B=69, and then go to Effect > Stylize > Drop Shadow. 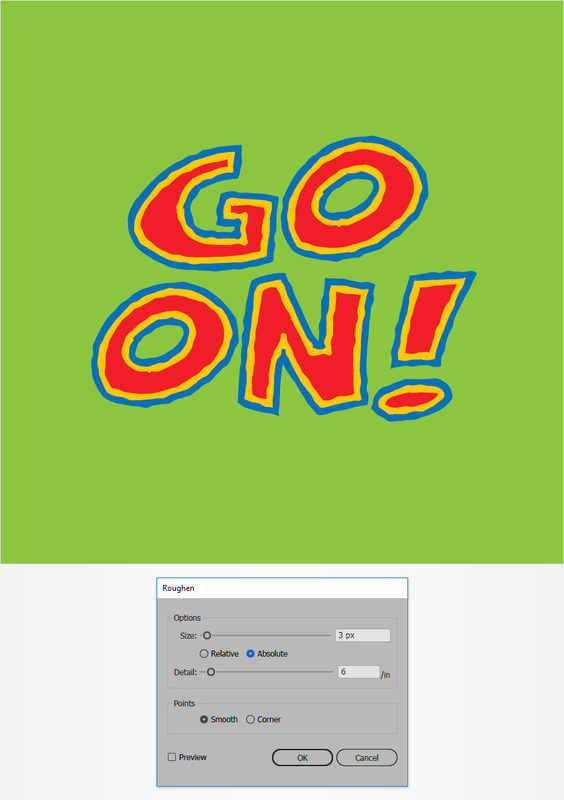 Enter the attributes shown in the left window, click the OK button, and then go again to Effect > Stylize > Drop Shadow. Enter the attributes shown in the right window and then click that OK button. Make a new copy of your red compound path (Control-C > Control-F), bring it to front (Shift-Control-]), and replace the existing fill color with white. Select your pink compound path along with the green rectangle, and add copies in front (Control-C > Control-F). Bring these two copies to front (Shift-Control-]), and then click the Minus Front button from the Pathfinder panel. Turn your resulting group of shapes into a compound path (Control-8), set the fill color to R=0 G=104 B=55, and then go to Effect > Stylize > Drop Shadow. 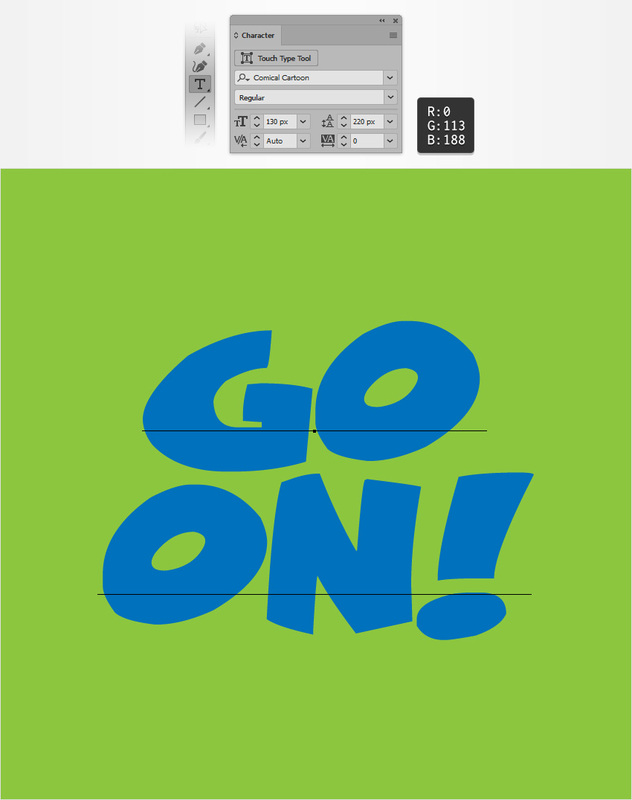 Enter the attributes shown in the left window, click the OK button, and then go again to Effect > Stylize > Drop Shadow. Enter the attributes shown in the right window and then click that OK button. Make a new copy of your pink compound path (Control-C > Control-F), bring it to front (Shift-Control-]), and replace the existing fill color with white. Select this white compound path along with the one made in the previous step, go to the Transparency panel, and click that Make Mask button. Select your blue compound path and focus on the Appearance panel (Window > Appearance). 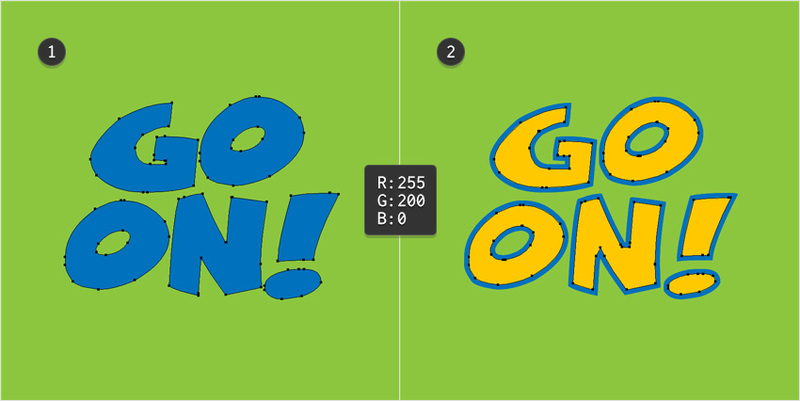 Select the fill, replace the existing color with R=117 G=181 B=32, and then go to Effect > Stylize > Drop Shadow. 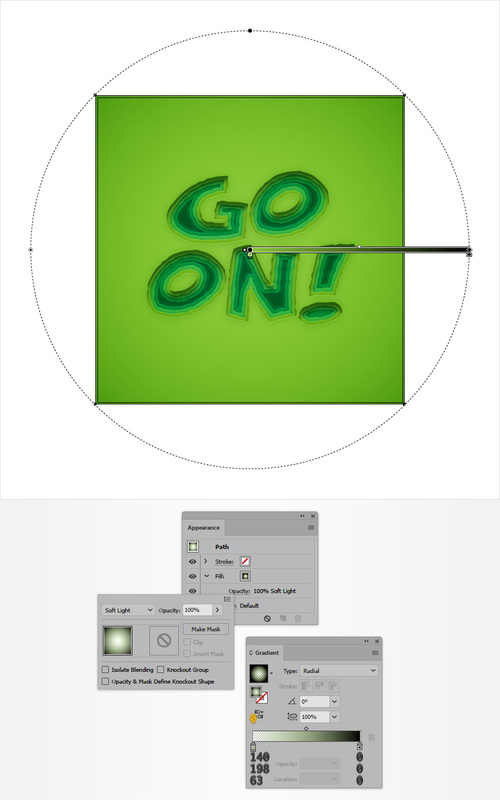 Enter the attributes shown in the following image, click the OK button, and then go to Effect > Stylize > Outer Glow. Enter the attributes shown below and then click that OK button. Select your yellow compound path and focus on the Appearance panel. 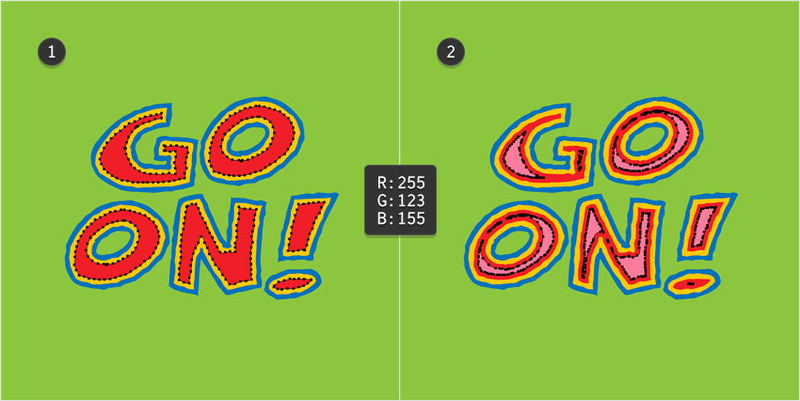 Select the fill, replace the existing color with R=57 G=181 B=74, and then go to Effect > Stylize > Drop Shadow. Enter the attributes shown in the following image and then click that OK button. Select your red compound path and focus on the Appearance panel. 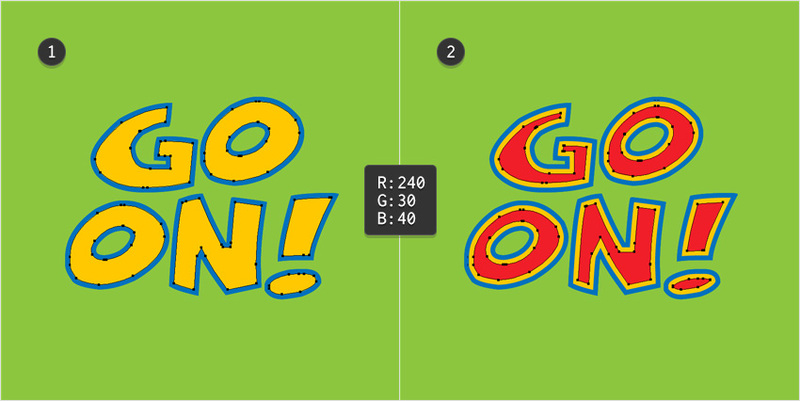 Select the fill, replace the existing color with R=0 G=146 B=69, and then go to Effect > Stylize > Drop Shadow. Enter the attributes shown in the following image and then clickOK. Select your pink compound path and focus on the Appearance panel. 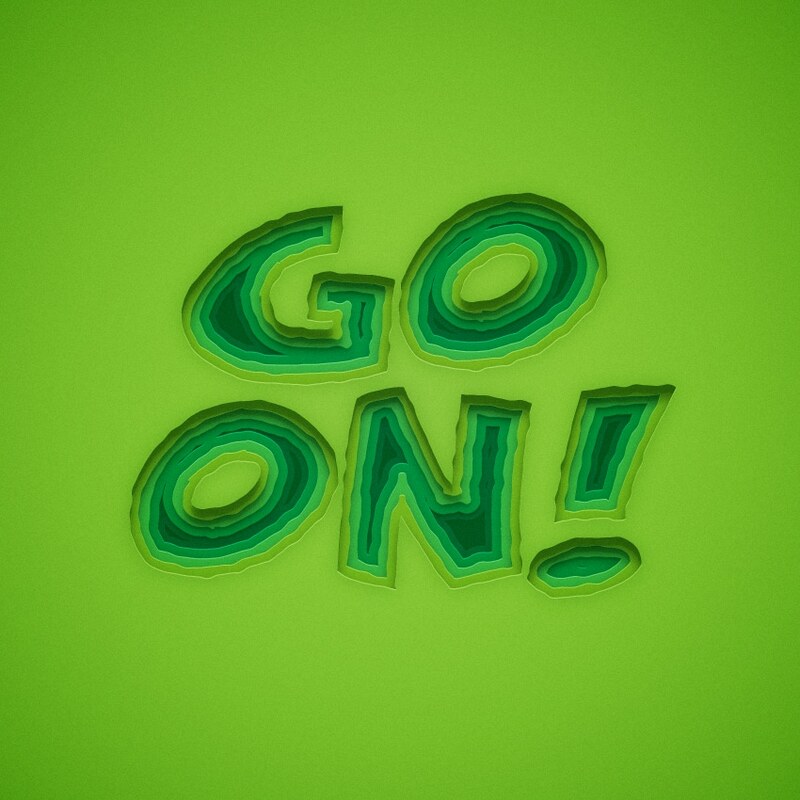 Select the fill, replace the existing color with R=0 G=104 B=5, and then go to Effect > Stylize > Drop Shadow. Enter the attributes shown in the following image and then click that OK button. Make sure that your darker compound path is still selected and keep focusing on the Appearance panel. Add a second fill using the Add New Fill button, and then select it. Set the color to R=0 G=84 B=35, and then go to Effect > Path > Offset Path. Enter a -7 px Offset and then click that OK button. 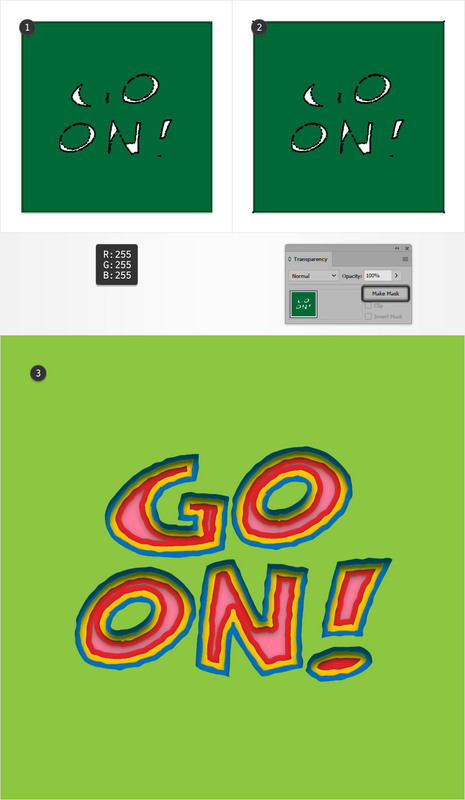 Select your green square, make a copy in front (Control-C > Control-F), and bring it to front (Shift-Control-]). Make sure that this new shape stays selected and focus on the Appearance panel. Select the fill, change its Blending Mode to Soft Light, and then replace the existing color with the radial gradient shown in the following image. Keep in mind that the yellow zero from the Gradient panel (Window > Gradient) stands for Opacity percentage. Make sure that the square added in the previous step is still selected, focus on the Appearance panel, and add a second fill using that same Add New Fill button. Select this new fill and set the color to black (R=0 G=0 B=0). Lower its Opacity to 10%, change the Blending Mode to Soft Light, and then go to Effect > Artistic > Film Grain. Enter the attributes shown in the following image and then click that OK button. Here’s how it should look. I hope you’ve enjoyed this tutorial and can apply these techniques in your future projects.